When you reach Level 5, you can expand your farm to unlock a new, lucrative ability: Crafting! Use the Ingredients obtained from your Crops, Animals and Trees to create delicious Crafted Goods that you can sell for Coins in your Market Stand. 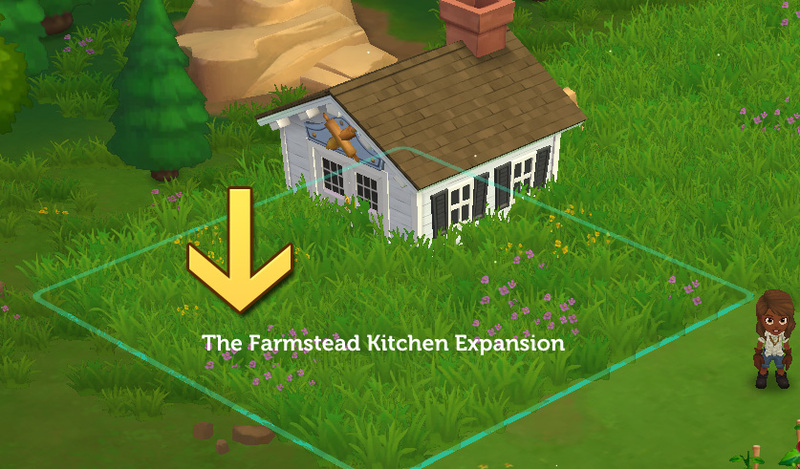 When you unlock the expansion directly to the left of your starting farm (The Farmstead Kitchen), you will reveal the Crafting Kitchen. 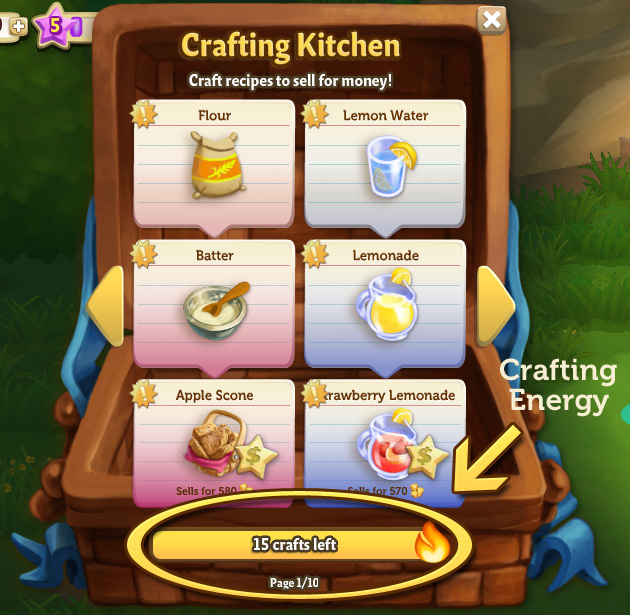 To get started, click on the Kitchen to access the Crafting Menu. · What level you are: Recipes in the Crafting Kitchen have level requirements. This means you have to keep leveling up to unlock new Recipes. 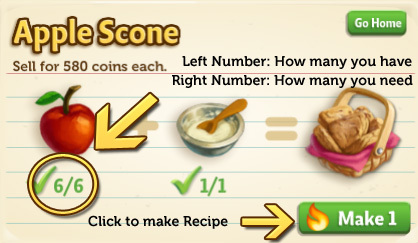 The more advanced you are in the game, the more complicated your recipes will be—but they will sell for more coins, too! 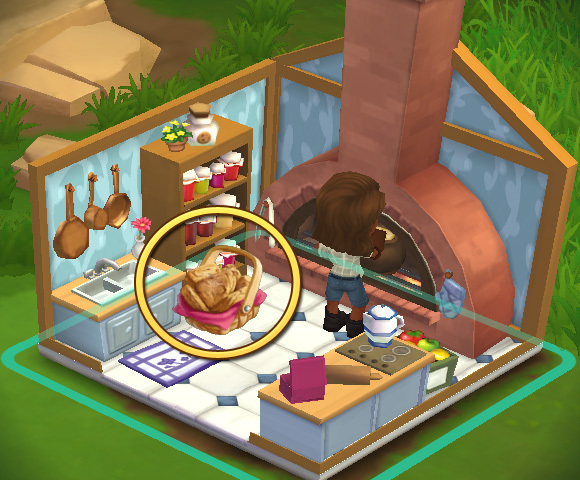 · What Ingredients you have available: As you harvest Crops and collect from your Animals, you can use these items to craft recipes. What Goes Into a Recipe? Ingredients: Raw ingredients come from your farm or Neighbors. Get them by harvesting Crops and Trees, feeding your Animals and visiting your Neighbors. Some Ingredients can only be obtained from your friends, so be sure to ask nicely! 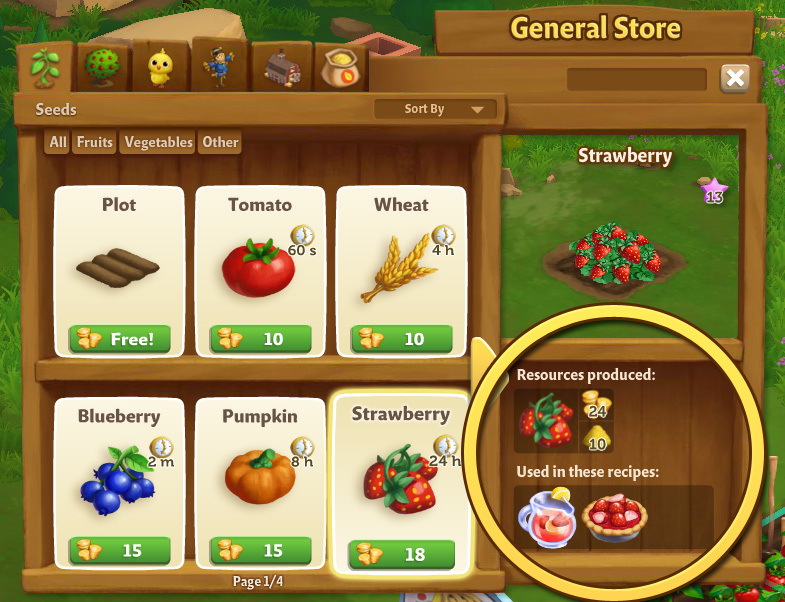 o Crops: Produce Ingredients like wheat, blueberries, strawberries, pumpkin, etc. o Trees: Produce tree fruit like apples, lemons, oranges, etc. o Animals: Produce Ingredients like eggs, milk and cheese after you feed them. o Salt and Sugar: These are Ingredients that you will need to get from your Neighbors. o Are you in a hurry to craft, but don’t have the Ingredients you need? You can purchase Ingredients with Farm Bucks. · Crafted Goods: These are Recipes that you make in your Crafting Kitchen from raw Ingredients. Use them to complete Final Recipes (see description below), which can then be sold in your Market Stand. Completed Crafted Goods, such as Batter, Flower, and Lemon Water, cannot be sold. · Finished Products (Final Recipes): These are Recipes that you can sell for coins in your Market Stand. These Recipes require Crafted Goods to complete. They are marked with a star symbol. 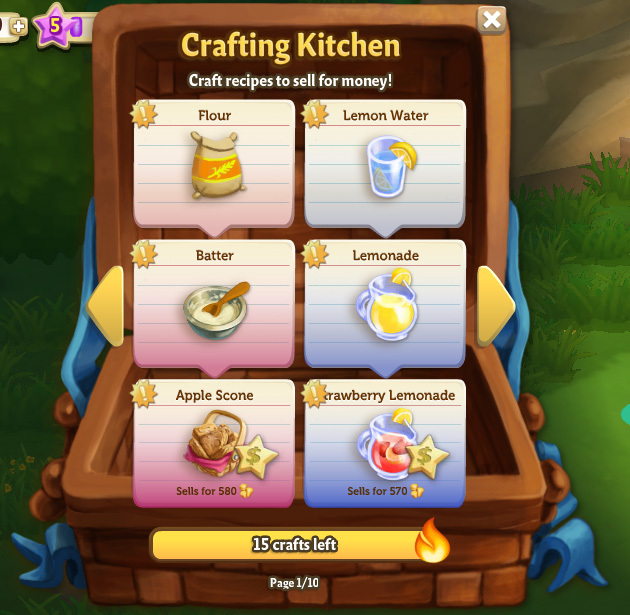 The Crafting Kitchen Menu displays all of the Recipes you currently have available. To access this menu, simply click on the Kitchen. This symbol is used to indicate a new Recipe you have recently unlocked. This symbol is used to indicate a Recipe that has a Level Requirement higher than your current level. To find out which level you need to be on to unlock a certain recipe, simply hover over the Recipe Card. These are Recipes that you can sell for coins in your Market Stand. These Recipes require Crafted Goods to complete. The Apple Scone is the Final Recipe in this Chain. It requires the first two Crafted Goods (Flour + Batter) in this Chain to complete. NOTE: Clicking the green “Go Home” button in the corner of a recipe card will take you back to the Recipe thumbnail screen in your Kitchen. Some Recipes require a Crafted Goods instead of Ingredients. If you come across a Recipe like this, you may feel a bit confused. But no need to worry, making the required Crafted Good is simple! Just click on the “Craft” button located under the Good you need to make. This will open up the applicable Recipe Card. Once you have all the ingredients that you need to finish your Recipe, click the “Make 1” button on the Recipe Card. It should turn green to let you know that you’re ready to go. After you click “Make It,” your recipe should craft instantly. Once it’s made, it will pop out of the oven and dance merrily around your kitchen before placing itself into your inventory. Don’t worry if you don’t mouse over it fast enough to scoop it up—it will go there automatically! Creating all of those yummy treats isn’t easy. To stay in business, the Crafting Kitchen requires Power (Crafting Energy). Every time you use your Kitchen to make a Recipe, it will deduct from your power reserves. The amount of power you have left can be found at the bottom of the Crafting Menu. · Give it some time— Power for your Crafting Kitchen gradually replenishes itself after 1 hour. Once you’re finished Crafting, it’s time to earn some money! Your Finished Products can be sold in your Market Stand for Gold. The more difficult the Recipe, the higher the Coin yield will be. As a reminder, you won’t be able to sell Crafted Goods in the Market. Only Ingredients and Finished Products can be sold.